THERE has been mixed reaction to the release of Infrastructure NSW’s State Infrastructure Strategy today. The strategy advises the NSW Government on the priority infrastructure investments and reforms required to drive productivity and economic growth throughout the state. The recommendations cover the next five, 10 and 20 years. Wollongong Lord Mayor Gordon Bradbery has welcomed the recommendation that $500 million will be allocated to a program to accelerate works on the Wollongong-Sydney rail line. The report recommends over $500 million on mainline acceleration program to shorten travel times between Wollongong and Sydney for rail passenger commuters with a one hour express (0-5 years). As well, $3 billion has been recommended to connect the F6 to the Sydney Orbital, which would benefit Wollongong and South Coast by reducing travel times for residents and business people who need to drive to Sydney (10-20 years). Also the report recommends the Maldon-Dombarton rail line be predominantly funded by the private sector. 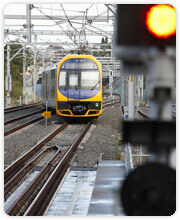 The report notes that the Maldon-Dombarton line would not be required for 10 years on current demand forecasts. “The disappointment for me is the time frame for the Maldon-Dombarton rail line (10-20 years) which I believe should be more short term (0-5 years) in other words near, immediate start,” Lord Mayor Bradbery said. State MP for Keira Ryan Park said he was disappointed that the Illawarra seems to have been forgotten in the much awaited report. “Illawarra residents have a right to feel very let down by this major report released today by the NSW Government. It is unbelievable, that NSW third largest city has simply gone off the radar when it comes to important Government infrastructure funding,” he said. “There is simply no excuse for this anymore, every single electorate is considered marginal in the Illawarra and there are now two Liberal MPs either ends of the region. This was the Liberal Government’s opportunity to say the Illawarra is a priority, unfortunately that is obviously not the case,” he said. Mr Park said there were any number of projects that could have been considered at a local level including upgrades to Bulli Hospital and construction of the major upgrades for the Mt Ousely Road truck stop and rest area.